Ebbetts Pass marks the high point of the Byway, as well as the demarcation between west and east sides of the route. It is also one of the five famed passes in Alpine County’s Tour of the California Alps—Death Ride, held every July, in which riders climb more than 15,000 vertical feet in 129 miles. In 1851, “Major” J.A.N. Ebbetts claimed to have led a group of miners and mules east over the Sierras, using a snow-free pass at the headwaters of the Mokelumne River. Later, in 1853, he led a railroad survey team across the Sonora Pass region. From a high peak just east of Sonora Pass he pointed north to the pass he thought he took in 1851 to George Goddard, a mapmaker. In 1854, Ebbetts died in a steamer explosion on the Napa River. In memoriam, Goddard placed the name Ebbetts Pass on the map he completed in 1856, approximately in the region he thought Ebbetts had pointed out. This pass was later utilized by the Big Tree and Carson Valley Turnpike, where the stone foundation of the toll station is located. Ebbetts Pass is registered as California Historical Landmark #318. Ebbetts Peak is a basaltic intrusive volcanic neck that extruded through the 90-million year old granite batholith during the Pliocene era (10 million years ago). Each summer a group of intrepid patriots place an American flag at the peak, which has a basic trail most of the way to the top. 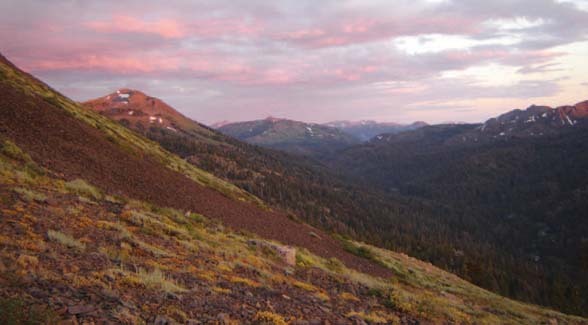 Take Note: There is little parking available at Ebbetts Pass; however, parking is available at the nearby nationally-recognized Pacific Crest trailhead.